No modern vehicle can match the excitement of these amazing cars from Superformance. Carroll Shelby was a legendary figure in the automotive industry, with the name "Shelby" synonymous with cars like the Cobra, Ford GT40 and Mustang. The name even continues today on models like the new GT350. The legacy that Shelby left behind is enormous. In fact, there's an entire industry built around recreating his most legendary car, the Cobra. There are lots of company's that produce "replica" Shelby Cobras, but we visited Superformance in Irvine, California to find out what makes the company the number one place to buy one. There are many replica Cobras on the market, but Superformance has the distinction of being the only company in the world to be endorsed by Shelby himself. Shelby said in 2006 that "Superformance International makes replica Cobras in South Africa and calls the two-seat roadster they build the MKIII. It's not a true Shelby, but I've endorsed and licensed the car for being as close to correct and well-built as possible." We could argue the semantics of what is a "real" replica all day long, but we'd rather take the word of one of the most respected men in the automotive industry. To us, these cars are as real as they get, which became even more of a reality when we got some seat time. We were able to go out in a few of the cars that Superformance builds, and each offered its own unique driving style. Superformance is mainly known for its Cobra models, the MKIII, MKII FIA and MKII Slab Side. These Cobras are available with a range of engine options that differ greatly in price. Most of the models that we saw for sale started at around $65,000, but can be optioned to more than double that for specialty models. The Cobra is not the only car that the company produces. Superformance also builds a recreation of the 1962 Chevrolet Corvette Grand Sport, which is a specially kit that is put on an actual 1962 Corvette model and can accommodate a variety of GM engines. Superformance also builds a recreation of the Shelby Daytona Coupe. Only six original Daytona Coupes were built because Shelby was reassigned by Ford to build the GT40. Still, the Daytona Coupe was legendary and a real example is pretty much priceless. The Superformance version is actually extremely luxurious, and is more comfortable than the Cobra. If American cars aren't your thing, Superformance is also a licensed Caterham distributer in the US. The company offers a range of Caterham models including the Seven 270, Seven 360, Seven 420 and Seven 620R. All of the Caterhams come fully built, but can also be ordered as a kit to build yourself. Superformance's ultimate halo car, however, is the GT40, the legendary LeMans racer that defeated Ferrari some 50 years ago. The Superformance GT40 is so good of a replica that over 90 percent of the parts are interchangeable. We didn't have chance to drive the GT40, but even standing next to it felt special. The GT40 is available for around $180,000, which may seem like a lot. But when you consider that it's a hand-built car that will turn far more heads than some used Ferrari or Lamborghini, the price seems justified. When we toured Superformance's warehouse in California, there was a special vibe that we couldn't put our finger on. We've been around many classic cars before, but the cars at Superformance had a special aura that reminded us of the glory days of racing. When we first arrived at Superformance, we were shown around by Rich MacDonald, who told us his story of what makes these cars so special. Rich MacDonald is the son of Dave MacDonald, a famous race car driver in the early 1960s. MacDonald was known for racing Corvettes in his early career, before transitioning to Cobras. It seems fitting that his son carries on his legacy after accepting a position at Superformance early in 2017. Corvettes and Cobras play a special role in the MacDonald family, something that was palpably felt when we took the wheel. Many people complain that replica cars cannot capture the magic of the originals, but we can say first hand that these cars do not drive like a modern day sports car, they have an edge to them that's hard to put into words. Driving them was a very special privilege, and we didn't take it for granted. Dave MacDonald was a professional, but he sadly lost his life in the 1964 Indy 500 at the wheel of a Mickey Thompson Ford-powered car. MacDonald was well respected by his peers, and even had Carroll Shelby and Mickey Thompson at his funeral as pallbearers. Even though these are replica cars, they embody the spirit of the originals. Superformance even built a limited run of 15 Cobras with the CSX2128 chassis number, which MacDonald raced in. We have a new respect for the men that helped design and race these cars with the enormous risk that was involved. Seeing one of these cars on modern roads is a sight to behold, and it was odd driving something so special door-to-door with modern crossovers and hybrids. Each of the cars that we got to drive was a unique and game-changing experience. The first car that we went out in was the MKIII Cobra. This car is powered by a 427 V8 from Roush producing 525 hp. Power went out through a Tremec five-speed manual transmission, which helped increase the vintage feel. The final cost of this Cobra was around $95,000, and driving it was so much more of an event than a similarly priced BMW M4. The Cobra drank gas at an alarming rate and we wouldn't exactly want to take a road trip in it, but we were grinning ear to ear as we wrestled with the old school controls and got an ear full of that amazing V8 sound. The next car that we went out in was the Shelby Daytona Coupe, which was a very different experience from the Cobra. Like the Cobra, the Daytona Coupe is powered by a 427 V8, but this one is built by Shelby. The Daytona Coupe actually has tons of creature comforts like a radio, air conditioning and a Tremec T56 six-speed manual transmission that makes it a joy to drive at highway speeds. We would have no problem taking a long road trip in this car and we would even love it as a daily driver. At just under $180,000 the Daytona isn't cheap, but we think it will turn way more heads at a car show than a used Ferrari 458 for the same price. The Corvette Grand Sport was the most unique of the cars we drove because it actually felt like an old car. The Cobra felt vintage, but with a hand-built quality that made it feel more modern. 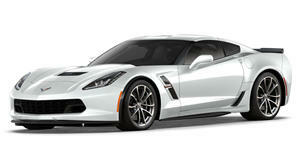 The Corvette felt like a car from the 1960's that had been given modern upgrades. Our car was fitted with a GM Performance LS3 that was bumped up to 525 hp. This was mated to a Tremec T56 six-speed manual. Even though the Corvette has power steering, it was old school power steering that felt even more period-correct thanks to a very loose-feeling deep dish style wheel. We got the feeling that this Corvette would be a monster on the track, but you would really have to be an amazing driver to take advantage of its capabilities. It had the heaviest accelerator pedal that we have ever used, which made it feel all the more meaningful when we wanted to hear that amazing LS3. We ended the day with the Caterham Seven 360, a car that we never could have guessed was so unique. For just under $75,000, it may seem hard to believe that this Caterham "only" comes with a 2.0-liter Duratec four-cylinder making 180 hp. However, the car only weights about 1,200 pounds, so 180 hp is more than enough. The car can hit 60 mph in just 4.8 seconds, but cornering is where this car really shined. Make no mistake, this is no beginner's car. We stalled the Caterham many times before getting used to its very light and finicky clutch. Once we got used to it, the Caterham had one of the most satisfying third-to-fourth shifts of any car we have ever driven. Superformance was a car enthusiast's dream to visit, and we were able to check several cars off of our bucket list after this trip. If you're the type of person that puts an emphasis on style and heritage over having something flashy with the newest bells and whistles, then Superformance has you covered.